Things have been busy in the garden. We’re very much throw it in, leave it and hope for the best kind of gardeners, some stuff worked better than others. We’re new to vegetable gardening so it has been a steep learning curve. 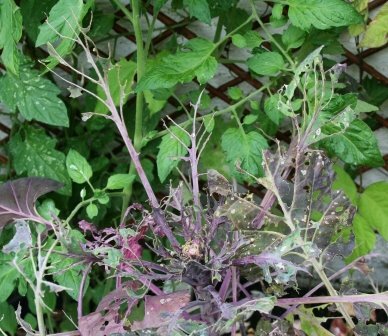 We’ve also had to contend with slugs and caterpillars chomping away at the leaves. Where is the resident Mr & Mrs Toad (who usually live under the BBQ) when we need them?!? I suppose we’re living proof you can grow veg in containers in a small garden and with no greenhouse. Although we’re by no means self-sufficient the few veg we have managed to grow has helped to cut down on shopping bills and nothing tastes better than veg picked fresh from the garden. When I saw the seed packet for Rainbow Carrots I knew I had to have them. 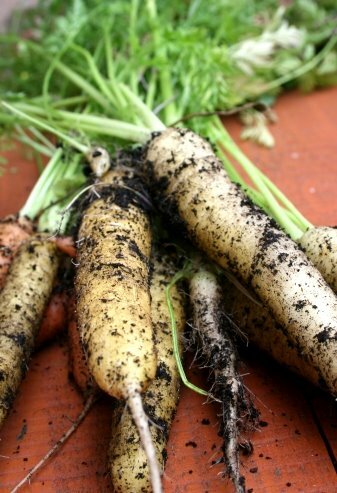 Although the seed packet was mixed it produced mostly white/yellow carrots that looked like parsnips. They may not have been the traditional carotene orange, but they sure tasted good. Sweet and succulent with a strong carrot flavour. They were very easy to grow, but lost some due to bolting back in July. This year we’ve grown 3 varieties of tomatoes. 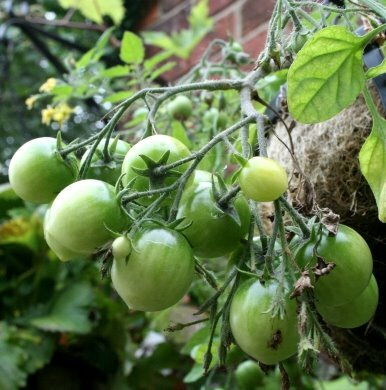 Tumbling Toms in hanging baskets plus Black Tomatoes and some tomatoes that according to the packaging are the sweetest in the world. They were started in Hubby’s dads greenhouse. We have lots of tomatoes, but none are ripen and ready to eat yet. We need to good few days of sunshine to get them red. If they don’t hurry up and ripen we’ll be making a huge batch of green tomato chutney. Today we dug up the last of the beets. These are the same beets I used in my crazy coloured beetroot risotto. 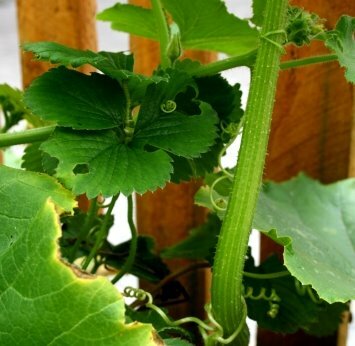 The shape of them means they are perfect for growing in pots. Like the carrots we lost some to bolting, but whats left are lovely sweet and earthy beetroots. When they started to grow they were so sweet and tender you could eat them raw. I think the Blue Ballet Squash plants deserve the award for the “I can take over the garden” award. We started out with 5 seeds. 1 didn’t germinate leaving us with 4 in the pot. As the plants grew 2 of the plants were transferred to my parent’s garden, it has now got to the point were I’m donating one of the plants to school’s Gardening Club as they are beginning encroach on the rest of the garden. According to the literature that came with the seeds “Each plant should produce two or three fruits up to 2kg each”. 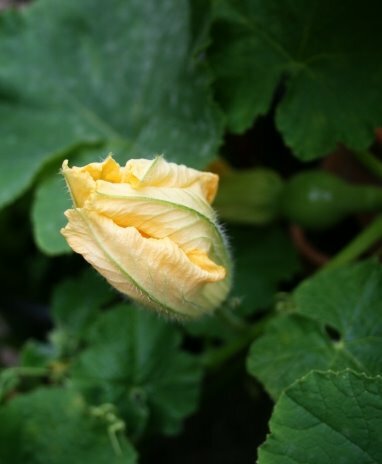 Trust me, the rate we’re going we’ll be eating squash for breakfast, lunch and dinner! I love the way the plant winds itself around anything it can grasp. It’s amazing how strong the little coils are. This is also one of the seeds we’ve been growing for the River Cottage Seed Project. In the next week we’re hoping to try some of the flowers. Now for the disappointing veg we’ve tried to grow. 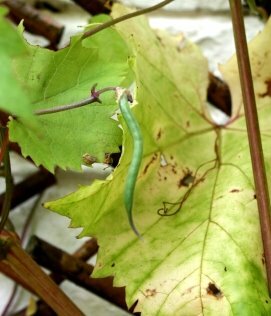 The picture above is the only Blauhide french bean we have. It’s about an inch long. I don’t think we’ll be cooking with it any time soon! It’s a shame as it is one of the River Cottage seeds. It could be that the pots are just not suitable for the beans. These Falstaff sprouts were doing fantastically until a few days ago. We’ve had a sudden infestation of caterpillars. Probably explains why the garden has been full of butterflies recently. Serves me right laughing at the state of the school gardening club’s cabbages, earlier on in the week, which are in a similar state. So with the lessons we’ve learnt this year Hubby has already ordered seeds for next year. Bring it on! After a stressful day back at school (& the kids are not even back yet!) I have to admit when I got home the last thing I wanted to do was cook dinner. I could have happily slobbed on the sofa with a takeaway, but I made myself go to the kitchen and prepare dinner as I find cooking therapeutic and soothing for the soul. When I’m cooking I get lost in my own little world and forget my worries. Recently I’ve also putting music on while in the kitchen and today was the turn of Mr Tennant…well not literally (I wish! )…but music from the last episode of Dr Who. There is something about this piece of music that makes me smile. One of the best stress relieving recipes is bread making. Even when I use the KitchenAid to knead the dough I like watching the ingredients combine and transform to a lovely soft dough. Tonight some serious therapeutic bread making was called for, so out came my recipe for pita bread to accompany the veggie bean burgers I was making. 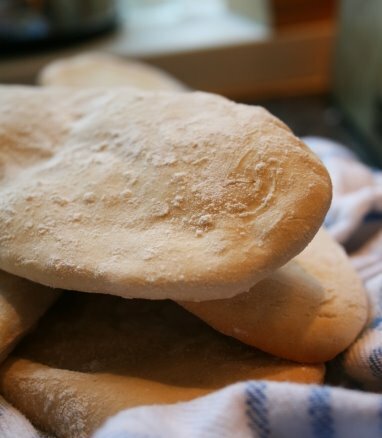 I thought I loved pita bread from the shops until I made my own. I could easily eat it hot from the oven and slathered in butter. Hubby has the same love. After reading Bread Matters (a highly recommended, eye-opening read) I’ve become more determined to make more of less all of the bread we eat. This has to be one of the easiest bread recipes I know. 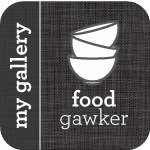 I’ve submitted my pitas to YeastSpotting. They featured my Tiger Breada few weeks back and it’s becoming a regular haunt for me as it is great inspiration. 1) In a jug mix warm water, yeast and sugar together. Leave for 15min for a froth to form on the top. 2) Preheat oven to 220oc. In a bowl mix together flour, salt and butter. Gradually stir in the yeasty water until you have a nice dough. Knead for 10 min by hand or 2 min in the mixer. 3) Split dough into 4 pieces and roll each into a sausage shape. Flatten each piece of dough with a rolling pin, until it is about 5mm thick. Place on a floured baking tray. Once all pieces of dough have been formed and placed on the baking tray, dust with flour and bake for 8-10 until puffed and golden. This seems to be doing the rounds amongst the blogs and it’s been interesting reading what people have eaten. 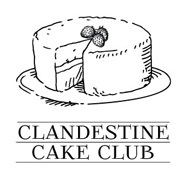 It was all started by Andrew at Very Good Taste. As a distraction from all the job applications I’m writing, here is mine. 59. Poutine does chips, cheese and gravy count?!? Ever since living in Germany as a child I’ve loved pretzels. I remember going to cafe and seeing racks of them hanging there ready to be eaten. In the UK decent soft pretzels are hard to come by so on a wet, cold Thursday afternoon I decided to have a go at making my own. 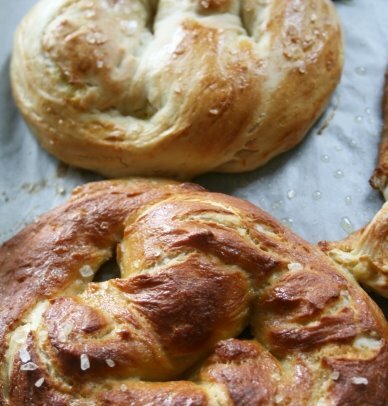 Traditionally pretzels are bathed in a lye (sodium hydroxide) solution before being baked, this helps give them the chewy, darkened crust. My local chemist already looks at me suspiciously after I asked for saltpetre, so I decided to go for the safer option of a sodium bicarbonate solution (water and bicarbonate of soda). Well they worked ok. They certainly had the right texture and taste, but lost their shape while being dipped. I think that may be due to the fact I’m still getting used to making dough in my KitchenAid and often find that dough comes out quite wet and springy. I made 4 pretzels in total and dipped 3. It’s clear in the photograph which have been dipped, the dark ones. The sodium bicarbonate solution is an base. When the pretezel is dipped in the solution and baked it causes the Maillard reaction to occur, which is similar to caramalisation. This in turn allows lots of new flavour compounds to be created, explaining why although pretzels are made with basic bread ingredients they taste very different to conventional bread. The dipped prezels have an almost green/yellow sheen that is more noticable on the underside. I assume this is something to do with the Maillard reaction. Interestingly there is a big differece in taste and texture between the pretzels that had been dipped and not dipped. The dipped pretzels tasted really good, even if they did look ugly and the undipped pretzel tasted like a dry, chewy bread roll. The recipe I used is based on a Alton Brown recipe, but I sized it down and converted it to grams. 1) In a large bowl mix together warm water, sugar salt and yeast. Leave for 5 min and allow to foam. Into the large bowl add the flour and melted butter. Mix until you have a dough then knead for 5 min if you have a mixer or 10 min by hand. 3) Knock back the dough and cut into 4. 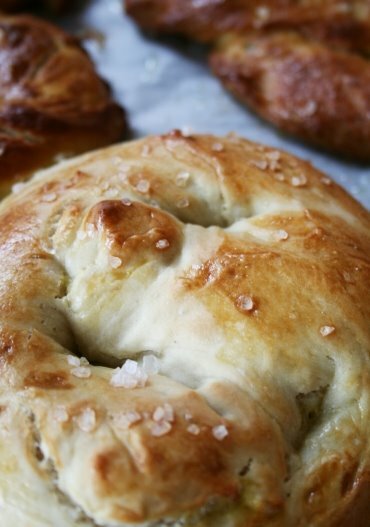 Roll the dough into a long sausage shape then knot into a pretzel shape. Place on a baking sheet onto of oiled baking parchment. 4) In a large saucepan get the water and bicarbonate of soda onto a rolling boil. 1 by 1 place the pretzel into the boiling water and take out after 30 seconds. Place back on the baking tray. Brush pretzels with the beaten egg then sprinkle with salt. 5) Bake in a 230oc preheated oven for 12-15 min. Allow to cool on wire rack before eating. Ideally they need to be eaten the day they are made. We’ve been growing a special variety of beetroot in the garden. 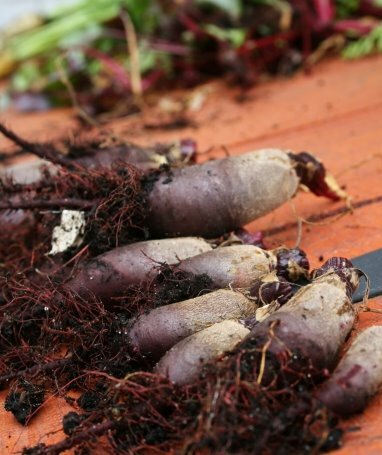 Rather than the beets growing round like a traditional beet they grow down in a tubular shape which is perfect for growing in containers. They have been ready for a few weeks and I’ve just been trying to come up with ideas for them, instead of just pickling them all. 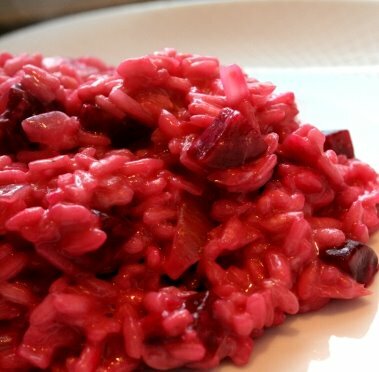 The weather is still appalling and we were in severe need of something to brighten us up so I decided to make a beetroot risotto. It ended up as a rather shocking pink and Hubby looked rather shocked when I served it up! As for the taste you could really taste the sweet, earthyness of the beetroot. 1) Roast beetroots (with the skins still on) in a foil parcel at 200oc for an hour. Allow to cool, peel off the skin and dice. 2) Gently fry onion and garlic in the olive oil in a deep saucepan for 3 min. Add rice and stir for a further 2-3 until the rice is translucent. 3) Pour in the wine and turn up the heat until the wine is absorbed. Gradually add stock 1 ladle at a time, each time waiting for the stock to be absorbed before adding more. 4) Stir in beetroot and leave for 4 min. Take off the heat then add creme fraiche, butter and seasoning. Leave for 2-3 min before serving. This week has been a bit crazy with a awe-inspiring theatre visit, poorly grandma (who is thankfully better), a wedding that turned out to be a Uni reunion and a fantastic weekend with friends. Wednesday was my trip to see David Tennant playing Hamlet at The Courtyard Theatre in Stratford. To say I was blown away by the performance would be an understatement. I was entranced for the whole 3.5 hours and it has reignited my passion for theatre. If you ever get the opportunity to see Hamlet or another play at The Courtyard Theatre grab it with both hands. The atmosphere and intimacy of the theatre is unlike any any other theatre I’ve been to. Saturday afternoon good friends R & N came to stay. 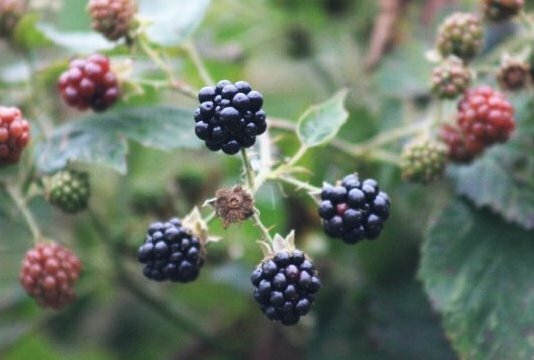 While dodging the rain showers we went for a walk and managed to come across a hedgerow laden with juicy blackberries. We spent a good 10 min tasting all the different berries. Most were succulent and delicious, but we did pick the odd tart one that made Hubby pull a face! That night we had all good intentions on having a BBQ, but it wasn’t going to be due to the wet weather. Anticipating the appalling weather I decided we could have steak as this could be done both on the BBQ or griddle pan in the kitchen. I don’t know if it was due to my post-theatre delusion, but I didn’t realise until we sat down to a dinner of steak, corn on the cob and crushed new potatoes that I had loaded each dish with herbs. The steak had been marinaded in herbs and soy sauce, the potatoes had mint and I made herby butter for the corn on the cobs…hmmmm. Thankfully my dessert of boozy crème brûlée , this time with blackberries rather than cherries, came to the rescue. It was all washed down with some lovely pinot grigio blush and Sugar Plum’s Pink Raspberry Sangria made with some delicious organic raspberry beer I found in Sound Bites. We didn’t realise until this morning how much we had drunk between the 4 of us. However none of us were hungover…may be something to do with the over-consumption of herbs in the main course! Many thanks to both Beth and Nilmandra for giving me the Arte Y Pico award. Now I should pass this on, but you’ll have to give me a couple of days to think about who I’m going to pass it on too. Thanks again. We’ve just returned from a lovely holiday where we ate out a lot. When we come back from holidays I always find it hard to get back into the swing of cooking again, so finding a copy of Delicious on the doormat provided some much needed inspiration. Included in this months Delicious was a supplement all about feeding your family for £5, something that lots of places seem to be doing at the mo. I tweaked the recipe for Pepper & Pesto Lamb with paste slightly to account for ingredients I already had in. For the 2 of us the ingredients came to less than £3. It was nice, but there was something missing and I’m not sure what. It didn’t have the depth and flavours that my bolognaise has. Tonight I’m leaving Hubby to his own devices as I’m off to gawp at David Tennant In Hamlet. I can’t wait! 1) Gently fry onions until softened. Add mince and brown. 2) Once mince has browned add red pepper, passata and pesto. Simmer for 25min. 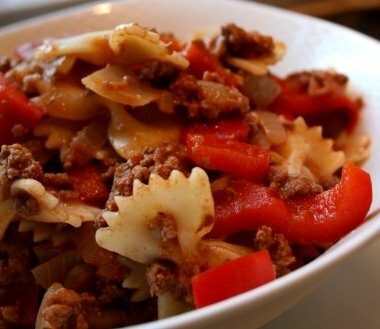 3) Cook pasta and stir into sauce. I WANT this T-shirt…need I say more. When I was a child the highlight for me when we were driving long distances to relatives was the lunchtime stop at Little Chef. I nearly always ate battered fish fingers (the only fish I would eat as a child), Jubilee pancakes and of course the free orange sherbet lolly. Looking back there was probably minimal cherries in the pancake, but it still tasted good! As I’m on holiday I decided I should make more of an effort with breakfasts. A nice change from weetabix and banana. The great thing about Scotch pancakes is that you can alter the topping you sprinkle on top. As I have some cherries left over and I didn’t want to waste them I used them on the pancakes…although the cherries look suspiciously like slices of salami in the photo! 1) Sift flour, baking powder, salt and sugar into a large bowl. In separate bowl lightly whisk milk and egg together, then add melted butter. 3)Heat pan till medium/hot. If not using a non-stick pan melt a small amount of unsalted butter in the pan. Use a dessert spoon to blob some of the mixture in the pan. Sprinkle some of the cherries over the batter surface. Wait until you see bubbles appear on the surface. Flip over. Cook until golden brown and risen to about 1 cm. I used the lovely Mallika’s recipe for Saag Aloo. I’m not sure if you can use the word “saag” if it is made with chard, hence why I’ve called it Chard Aloo. I made a very tasty curry that I will certainly be having again.